Welcome to Online Reasoning Test in AffairsCloud.com. We are starting Cumulus Course for SBI PO 2018 Main Exam and we are creating sample questions in Reasoning section, this type of Question will be asked in SBI Clerk 2018!!! 6 Vans – P, Q, R, S, T and U are parked in a straight line not necessarily in the same order. Distance between each van is a successive multiple of 3. The distance between vans P and Q is 36m. P is parked immediate left of Q. The distance between vans Q and R is 81m. van S is parked left of R but not immediate left. The distance between vans T and U is 108m. The distance between vans T and S is a multiple of 2. van U moves for 12m in North direction, takes a right turn, moves for 69m, takes a right turn again, moves for 6 m and stops at point K. van R moves for 18m in South direction, takes a right turn, moves for 81m, takes a right turn again, moves for 7m and stops at point L. van A is parked 23m west of point K. It moves 76 m towards west and stops at point B. How many vans are parked between S and U? Van T will have to travel how much distance to reach point L? What is the distance between points K and L? What is the position of van A with respect to the last van in the right end of the row? What is the maximum distance between any two vans? Directions (6-10) Study the following information carefully and answer the questions given below. 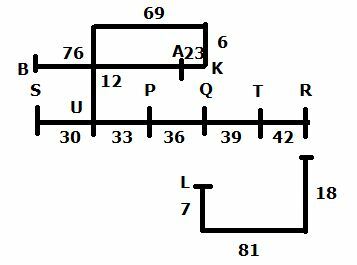 When a word and number arrangement machine is given an input line of words and numbers, it arranges them following a particular rule. The following is an illustration of Input and rearrangement. (All the numbers are two digit numbers.) As per the rules followed in the given steps, find out the appropriate steps for the Input. How many elements are there between ‘shrp’ and ‘Tool’ in Step IV? Eliminate vowels and arranged in descending order. In which of the following steps is ‘kt nml 77’ found consecutively in the same order? Which of the following is the fifth element from the left end in the Step III? In Step IV, ‘shrp’ is related to 15 following a certain pattern. Following the same pattern, in Step V, ‘Tl’ is related to ’77’. In step IV, to which of the following is ‘Mndy’ related to?